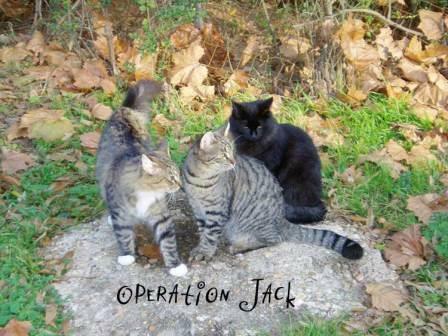 Operation Jack, FuRR's feral cat Trap/Neuter/Return (TNR) program has saved the lives of hundreds of fearl and stray cats since its beginning in the summer of 2007. This program was born from our search for Jack, a very special shiny black fella who was last from his home in downtown Little Rock on January 1, 2007. We spent many weeks searching the alleyways and basements in the area, posting flyers and knocking on doors, and crawling undernearth abandoned houses. We didn't find Jack, but we did find a a problem. The many feral cats in the area in need of spay and neuter. Suprisingly a number of them had caregivers willing to feed them but with no means for pay for their surgeries. Who are these feral cats? They are free-roaming cats which generally are one generation or more removed from being house pets, and their offspring. 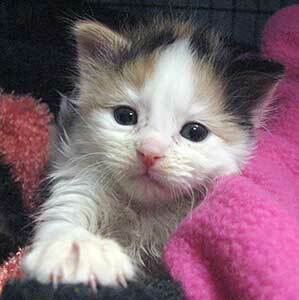 They aren't socialized to humans and only very rarely can be tamed, but their kittens, if caught young, can become pets. Found living among the truly ferals, may be the cats who were once pets but have been abandoned or gotten lost and have learned to survive on their own and joined a feral colony. These cats, when captured can often be re-socialized to live with humans. But their initial reaction to being capture is often frantic and they can mistaken for feral. While you will never be able to hold a true feral in your arms and cuddle it, caregivers do develop strong relationships with the cats in their colonies. This relationship is different from usual human to cat, but just as precious as the one you have with the kitty who has shared your pillow since kitten hood. Kitten season in 2013 has been really, really hard to work through. FuRR has received several calls daily from colony caregivers, cat lovers, and people with huge hearts who have found lost, abandoned, or stray cats and their kittens. Operation Jack offers spay/neuter assistance for these cats that are trapped, brought to our clinics, altered, vaccinated, and treated for parasites (fleas/ticks/worms). This practice significantly prevents the birth and suffering of more cats. Economoic times are hard and we have seen a large increase in the number of cats being abandoned and left to fend for themselves and free to breed. Operation Jack funds are low and we need your help. We can always use financial support, donations of food, and annual sponsorship. We are making a huge difference, but we need your help! If you are interested in helping us continue our mission of reducing the overpopulation of cats in Arkansas, please Contact Us, or consider a Donation.